Orthogonal side chain protecting groups, particularly for Fmoc-based solid phase peptide synthesis, are growing not only in diversity, but also in popularity. These protecting groups enable post-synthesis chemistry while the peptide is still on resin, often times increasing efficiency, decreasing side reactions, and generally simplifying the overall process. I’ve already done some work with many of the commercially available orthogonally protected amino acids including allyl and alloc, Acm, and ivDde for a variety of downstream applications. In today’s post, I’ll discuss some work optimizing the removal of a 4-methoxytrityl (Mmt) group from cysteine side chains. Of all the cysteine side chain protecting groups, Mmt is the one I’ve used most frequently. However, I’ve struggled with how to measure the deprotection efficiency. As you may know, Mmt is removed with low concentrations of TFA however, any orthogonal deprotection can be masked by the penultimate peptide cleavage from the resin. After thinking about this for a off and on for a few months, I remembered from my past proteomics work that proteins are typically denatured, then cysteine residues alkylated prior to trypsin digestion and mass spec analysis. Often times, this reaction is completed in solution using aqueous conditions, but I was able to identify a previously published on-resin protocol to get me started. The nice thing about alkylating free Cys residues is that this is an irreversible reaction, enabling me to quickly identify how much of the Mmt protecting group was removed in the deprotection conditions and not the final cleavage and global deprotection. For these experiments optimizing Mmt removal conditions I first synthesized oxytocin, a short peptide that contains two cysteine residues with my Biotage® Initiator+ Alstra™ peptide synthesizer using Fmoc-Cys(Mmt)-OH for both cysteine residues. With on-resin alkylating conditions in hand, I divided the resin from a single synthesis into roughly equal quantities and evaluated a variety of reaction conditions with 2% TFA in DCM and 5% TIS to scavenge the released Mmt groups, Table 1. Interestingly, in all of the different protocols I observed doubly alkylated, singly alkylated, and oxytocin with no alkylation, Figure 1. 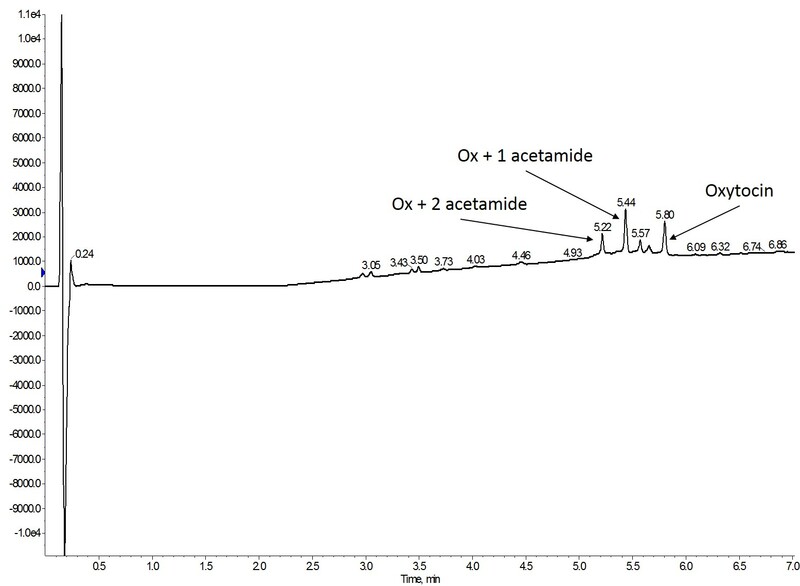 Figure 1: Representative analytical HPLC chromatogram observed for all Mmt removal conditions. For these studies, oxytocin is a linear, fully reduced peptide in all peaks. This bears the question though – does the alkylation reaction require additional optimization or are the deprotection strategies really that inefficient? My assumption at this point is that the alkylation reaction requires some additional optimization for this particular peptide as I’ve used one of these methods in the past for on-resin cysteine oxidation and found complete conversion by analytical HPLC chromatography. Regardless, this mixture complicates my analysis needed to determine the most efficient deprotection protocol. Ultimately, I decided to compare the total alkylated peptide content (singly plus doubly alkylated) to the unmodified oxytocin content as a percentage of the loaded sample amount, Table 2. Based on these results, it is clear that a 10 min reaction time repeated a total of 5 times yields the greatest percentage of Mmt deprotected cysteine side chains. Typically, this (and other) orthogonal protecting groups are used to enable additional post-synthesis chemistry and for that to be successful, this percent deprotection will certainly have to get closer to 100% completion; but this is certainly a good starting point! To further optimize this reaction, I’ll likely increase my TFA concentration before increasing iterations or reaction time. I am still curious how much further optimization would be necessary to fully alkylate the cysteine residues on resin, although this is somewhat less interesting from a functional peptide perspective. Stay tuned for a future discussion! I encourage your comments below on your favorite conditions for removing an Mmt protecting group. If you have found this blog and content informative or have any suggestions for topics, please share your feedback and complete our survey. I’d love to hear from you! Previous Previous post: Disulfide rich peptides – in which order should the disulfide bonds be formed during on-resin oxidation?